So you’re thinking of adopting lean manufacturing at your workplace, huh? But what will you tell employees and managers? How will you explain lean to them? In this article, we’ve got some ideas, suggestions, and tools for you to use. 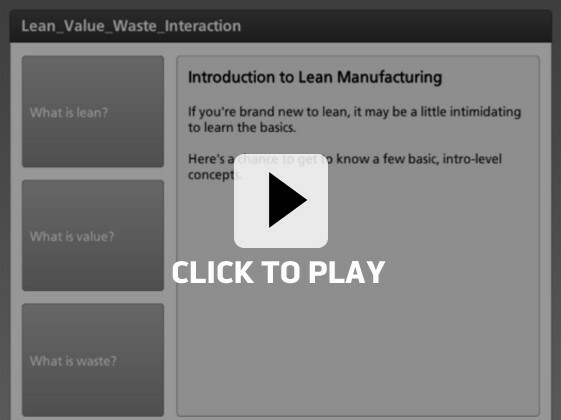 We think these can help you introduce lean to rank and file employees and managers. Then you can go on to get into these ideas in more detail and to introduce more ideas over time. But that doesn’t mean we’ve got the perfect list. So if you’ve been through this before, feel free to share your own ideas and thoughts. That’s what the comments section is for at the bottom of this article. 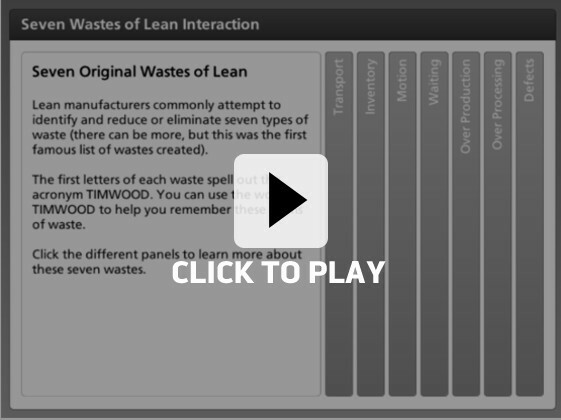 You’ll also notice we included the names and links to a few classic lean books. Again, feel free to recommend some of your own faves in the comments section. We hope this helps you with your manufacturing training program. Convergence Training are manufacturing training experts. Explore the links below to learn more about what we do. Let’s say you’ve heard about lean. You’ve read about it and you’ve studied it, and you’re excited by it. Even better, you’d like to introduce it at your workplace. But how and where do you start? What are the things to mention on the first day, or the first few days? So let’s do it, huh? 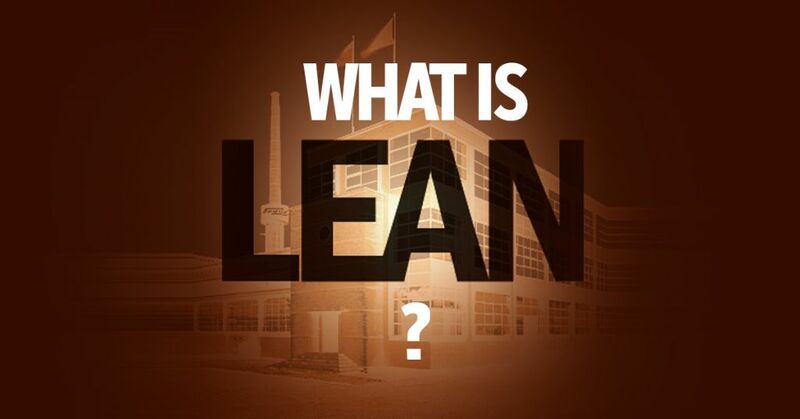 Lean is a method for making a manufacturing process more efficient. That process of “making a manufacturing process more efficient” is performed by identifying and focusing on value creation and getting rid of stuff that doesn’t contribute to value creation. Value is determined by your customers. If they’d be willing to pay for a process or action so that it’s part of the good or service they’re buying, it’s contributing value. If they wouldn’t be willing to pay for it, it doesn’t contribute value. And Then What Is Waste? Waste is anything you’re doing that doesn’t create or increase value. Once you’ve identified value, you can begin to identify, reduce, and eliminate the waste that doesn’t contribute to value. And that’s what makes you more efficient. Click the arrow button below to review what you just learned and then quiz yourself. Muda: Something that doesn’t add value to a process. Mura: Unevenness in an operation. This is the “classic” sense of waste that we’ve discussed throughout this article–anything in a process that doesn’t contribute value. Muda type 1: Doesn’t add value as determined by the customer but is still necessary and therefore can’t be eliminated now. Muda type 2: Doesn’t add value as determined by customer, is not necessary, and can be eliminated now. As you probably guessed, lean efficiency efforts focus by definition on muda type 2. Mura means unevenness or inconsistency. An example would be having a production line in which materials “pile up” at one production stage, creating an inventory of unused materials. Muri means overburden or unreasonableness. An example would be a machine or worker that’s overworked. Muda, mura, and muri are three different concepts. Yet, they’re related, and eliminating one can help you eliminate the others. 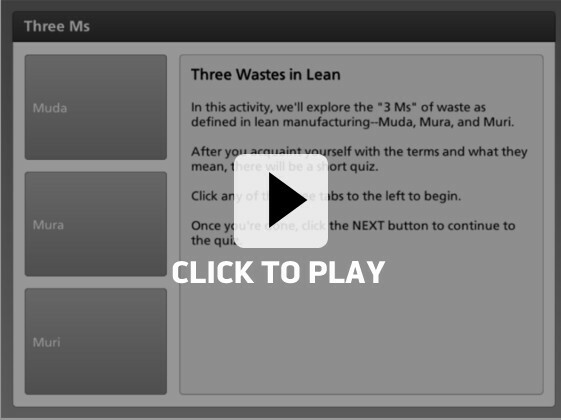 Click the arrow below to review what you learned and then quiz yourself on muda, mura, and muri. So now you know there are three general types of waste. We’ll focus on muda (which, as you probably remember, is something you’re doing that doesn’t add value) for the rest of this article. But don’t lose sight of the other two, and maybe we’ll write more about them in the future. Seven types of waste (muda) were originally identified by Toyota’s Chief Engineer, Taiichi Ohno, as part of the Toyota Production System (TPS). They were also reprinted in the classic book Lean Thinking by James Womack and Daniel Jones. That book is a recommended read and it’s where I’ve taken the list from. Excess Transport: Excess movement of the work in process, which wastes time and other resources. Excess Inventory: Excess inventory is a waste of cash and space. It requirements management and can become obsolete over time. Excess Motion: When people have to spend more time walking from place to place for their job, or looking around for things in a messy environment. Waiting: Time is money, and sitting around waiting is wasted time/money. Waiting can be caused by many things, including breakdowns, production bottlenecks, shortages of supplies, materials, and parts, poorly conceived processes without good “flow,” slow or absent workers, and more. Over Production: Creating more than demand. This is commonly considered the worst kind of waste, because it creates other forms of waste too. For example, if you produce too much, you’ve then got to use transport to move it to storage and use space to store it, plus it represents cash used to create it that you can’t use for other purposes. Over Processing: Work that’s part of your process but that adds no value as determined by your customers. Defects: Defective goods and/or rejects are a waste of time, money, and supplies. If you take the first letter of each of these wastes, you’ll get the acronym TIMWOOD, which may make it easier to remember. Click the arrow button below to review what you learned and then quiz yourself on the original seven wastes. As you’d imagine, since the original seven types of waste were listed, people have come up with others. Maybe you can think of more examples of waste? What are some of your own ideas–write them below in the comments section! One simple way to introduce lean to the workplace is begin with three aspects and build from there. It’s very common for companies just implementing lean to begin with 5S. 5S is a method for making a workplace more organized and efficient. Having a more organized, efficient workplace allows a company to increase value, decrease waste, and be more efficient. It also improves safety, which is a great bonus. 5S is a five-step process. Each step was originally named with a Japanese word beginning with the letter “S.” The English translations also begin with the letter “S,” conveniently. We’ve got the steps explained for you below. The first phase of 5S is to sort. Sorting means taking stuff from the workplace if it’s not needed for your work processes. You can put that stuff in long-term storage, or maybe you’ll dispose of it. Red-tagging is a process to help you sort. You just go around the work area and put a red tag on everything that’s unnecessary. Then, collect everything with a red tag on it, put all red-tagged items in a central holding area, and move each red-tagged item from the central holding area to an appropriate location (storage, trash, etc.). After everything that’s unnecessary has been removed, you should organize everything that’s left so it’s all in the best possible location. This means putting things where they’re easy to access when they’re needed and so that their location helps to increase efficiency and decrease waste. While sorting, consider marking areas with tape or paint so it’s obvious what goes where. This is part of what’s known as the visual workplace, which is a very important concept in lean. Want more information about visual workplaces and visual communication? Check the book The Visual Factory by Michael Grief. 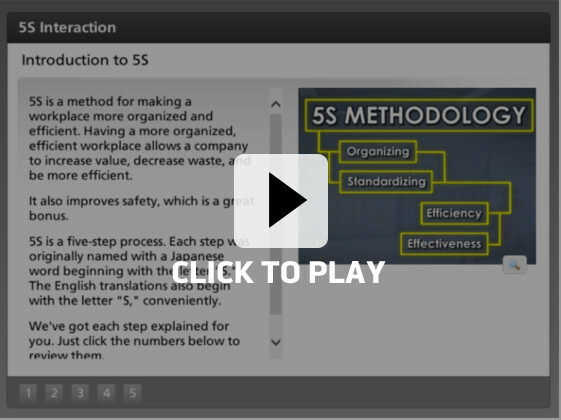 Below is a short sample from an online 5S training course. It explains the second S–straighten–and demonstrates putting things in their place and using visual communication to mark their place. Once you’ve sorted and straightened, then clean up the workplace. That’s what “shine” means. So now you’ve sorted, straightened, and shined. The workplace is looking good and you’re seeing more efficiency already. But don’t stop now. It’s time to standardize to make sure things stay this way. This means developing best practices to keep things as you’ve got them now and creating consistent procedures for performing jobs efficiently. To do this, include sort, straighten, and shine in people’s job responsibilities so they’ll be done consistently. Remember, if you don’t do this, things will return to “same old” quickly enough, and your gains will be lost. The final element of 5S is to sustain. That means to keep it going. Change isn’t easy, and if you don’t keep feeding the lean fire, things will break down. A great way to keep it going is to continue talking about it and make sure all employees feel involved. Welcome their feedback and insights. Signs, posters, meetings, and other methods of communication can also help keep the 5S method and practices fresh and make sure things don’t spiral out of hand again. And it’s important that management continue emphasizing their commitment to lean. Employees will notice this and act accordingly. It’s not easy to change a company’s culture. Keep beating the lean drum. Click the arrow button below to review what you learned and quiz yourself on 5S. Job standardization is the process of developing the single best way for a worker to perform each job task, documenting that method, teaching workers to perform the task that way, and then making sure that’s really how employees do perform the task. Managers and the employees who perform the task as part of their job should develop the standard method for doing the task together. Managers shouldn’t dictate this, as employees typically know the task better than managers do. You may find this book on the Training Within Industry (TWI) “Job Instruction” article of interest if you want to explore this topic further. Kaizen means something like “change for the better.” (For more information, read our longer articles on kaizen and kaizen events). Lean manufacturing depends on kaizen so that the company is always trying to improve, be better, create more value, and eliminate more waste. The goal of kaizen isn’t to make a single big change with drastic results. Instead, it’s to create a never-ending series of small changes, each of which leads to small improvements. The total effect of all those small changes, however, is a large improvement. Kaizen flips the traditional pattern of “change from above” upside-down. In kaizen, employees are given the power to make suggestions. In fact, one of management’s key roles in a kaizen culture is to train workers about kaizen and to encourage workers to make suggestions for continuous improvement. Once workers understand their role in kaizen and get used to doing it, they’ll become more active, engaged workers. As a result, the process of continuous improvement will begin moving forward, little bit by little bit. When employees see their suggestions implemented, and see the improvements that result over time, they’ll get even more excited and will become even more active participants in the kaizen culture at your workplace. Soon you’ll have a runaway snowball of kaizen! Kaizen will help you create a continuous self-improvement cycle–lather, rinse, repeat. If you’d like to explore this topic more, you may enjoy this article on kaizen and/or this article on the related-yet-different concept of kaizen events. But wait. 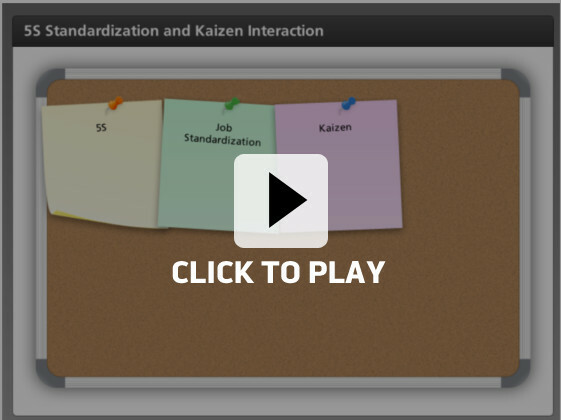 You may be wondering if job standardization and kaizen aren’t direct contradictions. That’s a good question, if you were. But actually, the lean idea of kaizen is closely linked with the idea of standard work. In lean, it’s considered important to have work done in a standard way, as we mentioned. But that doesn’t mean the standard way to do work can never change. If a worker comes up with an idea to make word more efficient (by increasing value and/or decreasing waste), the change is put into effect. Then the change is monitored and the results of the change are measured. Those measurements are compared to earlier measurements of the same work process before the change occurred. If the change truly did increase value, it’s kept and a new standard is created. If the change didn’t increase value, it’s scrapped, and the company returns to the old method and/or looks for a new way to modify the process. This process continues as long as the company does. Click the arrow button below to review what you learned about 5S, job standardization, and kaizen and then quiz yourself. Conclusion: What Else Should You Tell Employees about Lean? So what do you think? How did we do? Did we include the “right” stuff for introducing lean to your workers? If not, what might you add, what might you remove, or what might you change? And what stories can you tell us based on your personal experience of implementing lean at real workplaces? What worked well? What didn’t? Where were the big challenges and sources of opposition? Where were your big victories and successes? Thanks for reading. We look forward to reading your comments. 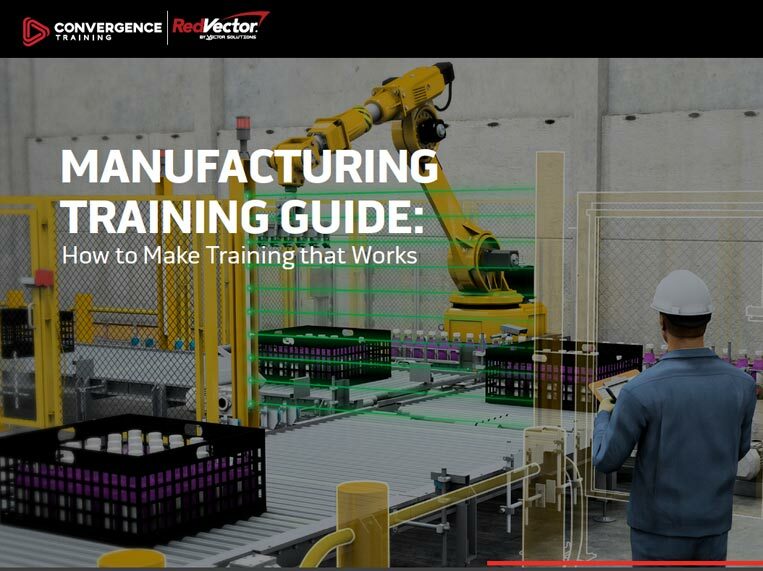 Let us know if you’d like to preview our online workforce training courses for manufacturers like you or our learning management system, designed to help administer training in a manufacturing environment. Before you go, why not download our free MANUFACTURING TRAINING GUIDE, below?